Why did we read this book: We are big fans of Zetta Elliott’s! Last year, we read and loved A Wish After Midnight and we’ve had the wonderful Zetta Elliott over for a guest posts and an interview in our April newsletter. When we learned of Ship of Souls of course we knew we had to do a joint review. Thea: Wow. I wasn’t sure what to expect when I started Ship of Souls, given its slender nature at under 200 pages (not that I have anything against slender packages, given that some of the most potent and effective stories I’ve ever read come with deceptively low page counts). I wasn’t expecting the power and poignancy of Ship of Souls, that’s for sure. This is a story that gets under your skin, that makes you feel and ache and love. If I had to sum up this novel in one word, again: wow. Ana: Word. This is going to be one of those reviews where I fully agree with Thea. 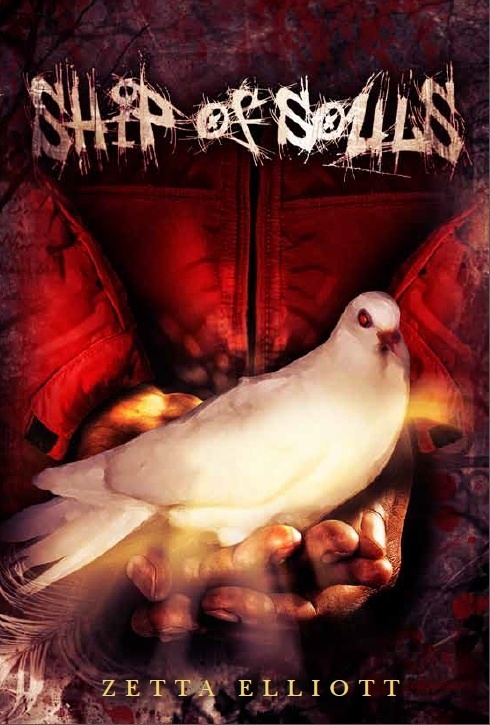 Ship of Souls is a seamless combination of Contemporary and Historical with a side of Urban Fantasy that works well on all of its fronts. It is basically a full measure of awesome in a small package and I just loved it wholeheartedly. Thea: Dmitri is an eleven-year-old boy that has never questioned how much his mother loves him. His father has never been around, but he’s always known that his mother’s love has been more than enough – together the two of them face the world. When his mom is diagnosed with breast cancer, and dies shortly after, D is left utterly alone in the world and sent into foster care. Desperate to get out of the group home system, D invents a perfect version of himself to impress anyone looking to foster a new child, and finds a home with the elderly Mrs. Martin. Determined to be the most perfect incarnation of himself, D is always on his best behavior with Mrs. Martin, careful to be polite, to help out around the house, and to take school seriously. It is here, at his new school that D meets and forms an unlikely bond with Keem, the popular basketball jock, as his math tutor. It is also here that he meets Nyla, the most beautiful girl in school, who takes D under her wing. Despite these new, tenuous friendships, D still feels utterly alone, but he takes solace in his trips to Prospect Park and in his favorite hobby of watching birds. One fateful day, he spies an unusual bird – a bird that speaks to D and knows his thoughts, fears, and deepest hopes. The bird is no ordinary bird, but a creature from another realm, named Nuru. Because D has no ties to bind his heart, Nuru has chosen him as her own host to aid her in her quest to free the souls of the dead. But soon, D discovers that his heart might not be so free – and he learns the power of true friendship, trust, and love. I repeat: WOW. D’s journey in Ship of Souls is breathtaking in its gravity and heartache. While, from a plotting perspective, the actual story proper is a rather small, contained thing, it is not without its taste of the fantastic, drawing a portal between the current world and the ghosts of the past through the magic of a very special park and its historical significance. Do you know what I love the most about Zetta Elliott’s work? In both A Wish After Midnight and in Ship of Souls, Elliott effortlessly weaves history – a painful, grim, but true history – with fantasy. In this novel, she explores one of the first major battles of the British-American Revolutionary war. In 1776, Prospect Park (along Flatbush Ave) was the battleground for British and Hessian soldiers as they fought the Continental Army (led by George Washington) – and this iconic battle serves as a key point for the story. To do this, to add on top of the historical commentary also one that explores the issues of race, gender, and religion in contemporary Brooklyn, this is no small feat. But Zetta Elliott does it all without making the story didactic or dry, by making these threads more than just a Message or underlying theme – each of these facets of identity are a part of our main characters (D, Keem and Nyla). Most of all, though, Ship of Souls is a story about a young boy as he grapples with the issues of grief, of isolation and neglect, and of love and friendship. But more on that in a bit. Ana: Yes, exactly! I loved how the story perfectly combines elements of Contemporary YA, UF and History without being excessive or without losing sight that at its core, this is the story of a young boy. Just like Thea, I was awed by how historical commentary (not only about the British-American War but also about African American Slavery) connects with current social commentary on issues of gender, race, religion. In that sense, I think the most impressive accomplishment of Ship of Souls is indeed how it is both self-contained but also part of something much bigger – it is a perfect example of how individual lives are affected by history which in turn affect current cultural and social arenas. And even when the story takes its turn into fully Fantasy territory it is the characters’ backgrounds and personal histories that move them. Another thing worth mentioning is how this story is imbued with a really strong sense of location – be it the Brooklyn of now or then, be it above ground or underground. And yes, all of it is expertly handled but like Thea mentions, it is not a dry, dull, didactic story – this was a very emotional read for me and I found myself in tears as the book came to a close with its beautiful and heart-warming ending. Thea: On the character front, Ship of Souls soars. Dmitri’s narration drives the story, and it is through the connection to the precocious young boy that the novel depends. D’s story is so heart-renderingly open, so painfully honest that you can’t help but fall in love with the character who so needs love in his life. From his mother’s life and death, to his time in the foster home, to his new life with Mrs. Martin, D’s story is one of heartbreaking young loss. Instead of falling into anger, though D compensates by trying to become the Perfect-D, the boy that will always strive to please, to keep his head down, to stay away from others to make sure he isn’t hurt or sent away again. When Nuru tells D that she has picked him precisely because his heart isn’t complicated with any other ties, I felt my own heart break for the young boy. And when D DOES make other connections, to Keem and Nyla, I wanted to pump my fist in the air with joy. THAT is how powerful Zetta Elliott’s characterizations are, especially for her young protagonist. The other two main characters are also beautifully drawn too, if they get a little less time than D in the spotlight. Hakeem is so much more than his label as a brainless jock – occasionally ostracized himself because he is Muslim, Keem gradually, begrudgingly befriends D through their tutoring sessions. And then, there is Nyla – beautiful and confident, Nyla has more piercings than D can count and doesn’t seem to have any problem changing and challenging people’s expectations or views of her. She also is a loyal friend, that cares for those that others call “freaks” – including D. These three characters form an unlikely friendship, and as things start to turn bad for D, both Nyla and Keem are there to help him, to fight for him, with him. This is awesome. I am not going to lie, dear readers. I teared up when I reached those last pages, when D finally realizes that Nyla and Keem aren’t just glad to be rid of him, and that they are truly his friends. Elliott’s writing is powerful, and her characters are what make the story so poignant. Problem is, most days I just feel numb. When I’m not numb, I’m miserable. And even when I’m not miserable, I’m still alone. This is an incredibly poignant moment that shows how extremely self-aware this young boy is – D has gone through a lot and prompted by the grief for his mother’s death he tries to detach himself from any deep connections with friends or with his foster mother in order to avoid more suffering. That frame of mind is what puts him in the path of Nuru and that’s how he becomes a hero for the trapped souls. I loved the subtle exploration about heroism, what makes a person become a hero (or not) and how heroes need not act by themselves. It explores the powerful effect of friendships, of opening up to people and of accepting (and offering) help in time of need. D’s developing friendship with Nyla and Hakeem is deftly handled and even though that friendship does happen quite fast, I didn’t think it was to the detriment of the story. Rather the contrary: I felt the fast, deep connection formed between the three to be believable and I loved all three characters and how well developed they were. That the author also manages to give strong voices to the long-dead ghosts of the soldiers and of the slaves is a thing of beauty, really. Thea: Ship of Souls is the second book I’ve read by Zetta Elliott, and I think it exceeds its predecessor. Beautiful, heartbreaking, and powerful, Ship of Souls is a book that I want to give to every middle grade and young adult reader. Absolutely recommended. Ana: Ship of Souls is that type of story that can be quickly devoured in one sitting, but it’s not a fleeting story – it stays, it matters, it has a long-lasting effect. I loved it and it’s definitely a Notable Read of 2012. I still hear her voice every day, and sometimes I even talk back. Mostly I just try to do the things I know she’d want me to do. Like keep my grades up, respect my elders, speak proper English – stuff like that. One of the nurses at the hospital gave me a pink ribbon pin to put on my jacket, but I put it in my pocket instead. I didn’t want to be a walking advertisement for Cancer. Plus, you get a ribbon when you win some kind of contest, and this time I didn’t win. I lost. Cancer won. Sometimes I push the pin into my finger just to make sure I don’t forget what losing feels like. I prick my skin and squeeze out a little blood. Feeling pain means I am still alive, and I know mom would want me to keep on living. Problem is, most days I just feel numb. When I’m not numb, I’m miserable. And even when I’m not miserable, I’m still alone. I saw this book on a list of the best YA fantasy/science fiction. The cover and the blurb scared me off, though. It’s officially on my TBR pile now, though! Wow. I didn’t know what to make of this book when it was recommended to me. But I’m glad to read your review. I will look for it. Wow, you have really intrigued me about this book. I’ve been reading your blog for a while but i think this is my first comment, mainly because once again you have turned me on to a book i probably wouldn’t have looked at otherwise. So thanks! Sold! I’d seen both of you mention being interested in this one before, but honestly didn’t sit up and pay attention until reading this fantastic review. I absolutely love when historical and fantasy elements are interwoven, and the fact that this is a contemporary as well makes it that much more intriguing for me. It thrills me that Ship of Souls is good. I’ve been eying the cover for awhile but haven’t heard much about it. Seriously, I just need to take a day and read this and A Wish After Midnight.